1. Process of removing tissue from patients for diagnostic examination. 2. A specimen obtained by biopsy. /bi·op·sy/ (bi´op-se) removal and examination, usually microscopic, of tissue from the living body, performed to establish precise diagnosis. aspiration biopsy biopsy in which tissue is obtained by application of suction through a needle attached to a syringe. brush biopsy biopsy in which cells or tissue are obtained by manipulating tiny brushes against the tissue or lesion in question (e.g., through a bronchoscope) at the desired site. 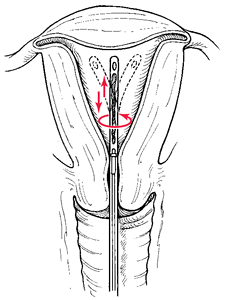 cone biopsy biopsy in which an inverted cone of tissue is excised, as from the uterine cervix. core biopsy , core needle biopsy needle biopsy with a large hollow needle that extracts a core of tissue. endoscopic biopsy removal of tissue by appropriate instruments through an endoscope. excisional biopsy biopsy of tissue removed by surgical cutting. needle biopsy biopsy in which tissue is obtained by puncture of a tumor, the tissue within the lumen of the needle being detached by rotation, and the needle withdrawn. Called also percutaneous b.
punch biopsy biopsy in which tissue is obtained by a punch. shave biopsy biopsy of a skin lesion in which the sample is excised using a cut parallel to the surface of the surrounding skin. stereotactic biopsy biopsy of the brain using stereotactic surgery to locate the biopsy site. sternal biopsy biopsy of bone marrow of the sternum removed by puncture or trephining. 1 the removal of a small piece of living tissue from an organ or other part of the body for microscopic examination to confirm or establish a diagnosis, estimate prognosis, or follow the course of a disease. 2 the tissue excised for examination. to excise tissue for examination. Kinds of biopsy include aspiration biopsy, needle biopsy, punch biopsy, and surface biopsy. bioptic [bī·op′tik] , adj. (1) A surgical procedure in which a small piece of tissue is removed from a patient. (2) The tissue itself; the histological changes seen in the biopsy are interpreted by a pathologist, usually under a microscope, who renders a diagnosis based on relatively standard morphologic criteria. Many biopsies are performed in an ambulatory (“outpatient”) setting and can be obtained by direct visualisation, or during an endoscopic procedures of the GI tract and elsewhere; when a suspicious lesion is detected, a small pincer is inserted through a fiberoptic endoscope, and a small portion removed for microscopic evaluation; usually, the tissue is fixed, processed in various solvents, embedded in paraffin, stained and examined by light microscopy. Less commonly, other techniques—e.g., immunofluorescence and electron microscopy—may be required to establish a diagnosis. While an experienced pathologist can readily evaluate most biopsy specimens, there are instances in which the tissue diagnosis cannot be made; in these cases, the specimen is sent to expert consultants for further evaluation. (3) Determine adequacy of surgical removal—e.g., tumours. 1. A surgical procedure in which a small piece of tissue is removed from a Pt. 2. The tissue itself; the changes in the biopsy are interpreted by a pathologist, usually under a microscope, who renders a diagnosis based on relatively standard morphologic criteria. See Abdominal wall fat pad biopsy, Agonal biopsy, Aspiration biopsy, Biochemical biopsy, Blastocyst biopsy, Blind biopsy, Bone marrow aspiration & biopsy, Breast biopsy, Cervical biopsy, Chorionic villus biopsy, Cleavage stage biopsy, Cold cone biopsy, Cone biopsy, Core biopsy, Endobronchial biopsy, Endometrial biopsy, Endomyocardial biopsy, Endoscopic biopsy, Excisional biopsy, Fine needle aspiration biopsy, Guided wire open biopsy, Heart biopsy, Incisional biopsy, Jumbo biopsy, Metabolic biopsy, Microbiopsy, Mirror image biopsy, Muscle biopsy, Needle biopsy, Nerve biopsy, Open biopsy, Open lung biopsy, Pleural biopsy, Polar body biopsy, Prostate biopsy, Punch biopsy, Renal biopsy, Salivary gland biopsy, Saucerization biopsy, Sentinel lymph node biopsy, Sextant biopsy, Shave biopsy, Skin biopsy, Skinny biopsy, Skinny needle biopsy, Small intestinal biopsy, Stereotactic biopsy, Stereotactic needle biopsy, Transbronchial needle biopsy, Transbronchial biopsy, Wedge biopsy, Wire-guide excisional biopsy. 1. Process of removing tissue from living patients for macroscopic diagnostic examination. 2. A specimen obtained by brush or needle and syringe aspiration for biopsy. A small sample of tissue, taken for microscopic examination, so that the nature of a disease process can be determined. 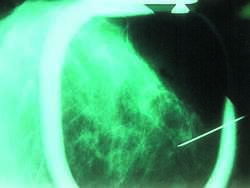 Breast biopsies are commonly done to investigate suspicious lumps. Suspicious skin growths are normally biopsied, and in the course of surgery under general anaesthesia, it is common for biopsies to be taken. The tissue obtained is soaked in molten paraffin wax and allowed to harden into a block. Very thin slices are then cut and mounted on glass slides for staining and examination by a histopathologist. the surgical removal of small amounts of tissue for examination to aid a diagnosis. Removal of a small piece of tissue for microscopic examination. This is done under local anesthesia and removed by either using a scalpel or a punch, which removes a small cylindrical portion of tissue. sample of tissue from a living subject. vt take such a sample. n the removal of a tissue specimen or other material from the living body for microscopic examination to aid in establishing a diagnosis. n See aspiration, fine needle (FNA). n the removal of an entire lesion, usually including a significant margin of contiguous normal tissue, for microscopic examination and diagnosis. n an exploration combined with biopsy to determine method and degree of local extension, usually of bone or deep soft-tissue lesions. n the surgical removal of a selected mass of a lesion and adjacent normal tissue for microscopic examination and diagnosis. n brand name: OralCDx; a noninvasive procedure used to detect early oral cancer during which a sterile brush is rotated against the suspected lesion to obtain a tissue sample. n biopsy material obtained by use of a punch. n a biopsy of skin or mucosal tissue made by removing part or all of a lesion with a scalpel held parallel to the base of the lesion. Q. I have seen that there are many types of biopsy done for a breast cancer patient…….. I have seen that there are many types of biopsy done for a breast cancer patient…….. On what basis they decide the mode of treatment? Q. What are side effects after you have had a temporal arteritis biopsy? A. like every biopsy- when there are anatomical variations you might cause damage. but that is fairly rare...from what i remember it's a very safe procedure.